Here are the steps that will help you to create some personalized and impressive coffee mugs. Pick any color permanent maker, if you’re having trouble deciding, black is the most classic and most common. You can select a marker according to your loved one’s choice. For instance, if your friend of family member likes red color then you should use a red permanent market. Preheat the oven to 350 degrees. While your oven is heating you can begin decorating your coffee mug. You can write a love message or an inspiring message on your white or clear coffee mug. You can write a funny message if you want to gift the mug to a close friend. You can also draw something on the mug. For instance if your loved one likes to swim then you can draw some fish on the mug and if they like soccer then you can draw soccer ball on the mug. Choosing the right mug can really help you in this project. So, check out some restaurant coffee mugs online and choose the prettiest one. Brands like the Webstaurantstore offers durable coffee mugs that are ideal for this project. Once you have decorated the mug, place it on a cookie sheet inside your oven. Let it bake for 30 minutes. Take the cookie sheet out of the oven after the 30 minutes are up and remove the mug from the sheet. Place it on a kitchen counter top and allow it to cool down completely. This will set the marker’s ink and it will not get washed off. Your coffee mug is now ready to be used. So, wrap it in a cute gift wrap and send it to your loved one. 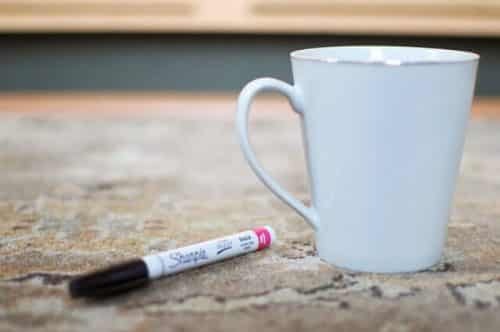 With only a sharpie and a light colored coffee mug can help you to show off your personality! Such mugs also make fantastic, inexpensive and emotional gifts for any occasion.